Washington State Dismisses Tavares Martin Jr. For "Violation Of Team Rules"
Ahead of their upcoming Holiday Bowl appearance against Michigan State, 9-3 Washington State has dismissed leading wide receiver Tavares Martin Jr. for an unspecified “violation of team rules.” Martin, a junior, had 831 yards receiving on the year. Martin was also disciplined by the team in October, when he was suspended for one game because of a reported “temper tantrum” that caused him to miss practice. 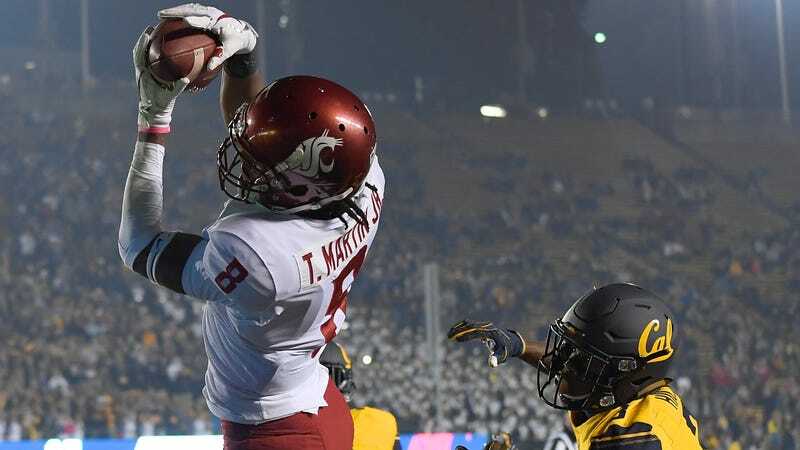 He’s the second Cougar wideout to leave the team since the regular season ended, as sophomore Isaiah Johnson-Mack, who has 555 receiving yards this year, announced that he wanted to transfer, though it’s unclear if head coach Mike Leach will grant that request. Update (4:35 p.m. ET): Martin says on Twitter that he was dismissed because he asked for a release from the team so he, like Johnson-Mack, could transfer.